Green Bay Metropolitan Sewerage District (“New Water”) ($70,000)The Fund for Lake Michigan is supporting the Green Bay Metropolitan Sewerage District with this $70,000 award for the purchase of an interseeder. 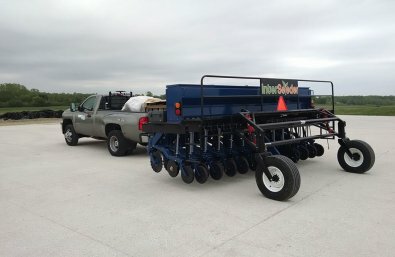 This new piece of farming equipment will help combat Green Bay’s nutrient runoff problem by allowing farmers to plant more cover crops in fields where corn is already growing. These cover crops remain after the corn has been removed, and therefore promote soil health and reduce runoff. The interseeder will primarily be used in the Duck Creek Watershed, as well as throughout Brown and Outagamie Counties.